Spring is indeed coming; maybe it’s here today two weeks ahead of schedule: rainy morning and a sunny lunch. Lunch today is earlier than usual; I came in at 7:45 am today, thanks to a rehearsal for my Saturday. Another sign of spring is the new specials at Falchi’s. Today at Khao Man Gai NY: homemade Spring rolls, either with tofu or chicken, filled with greens, cilantro, Thai basil, mint, shredded carrots and rice verminchelli noodles, with a side of tamarind peanut sauce. 1 roll = $3.00, 2 rolls = $5.00. 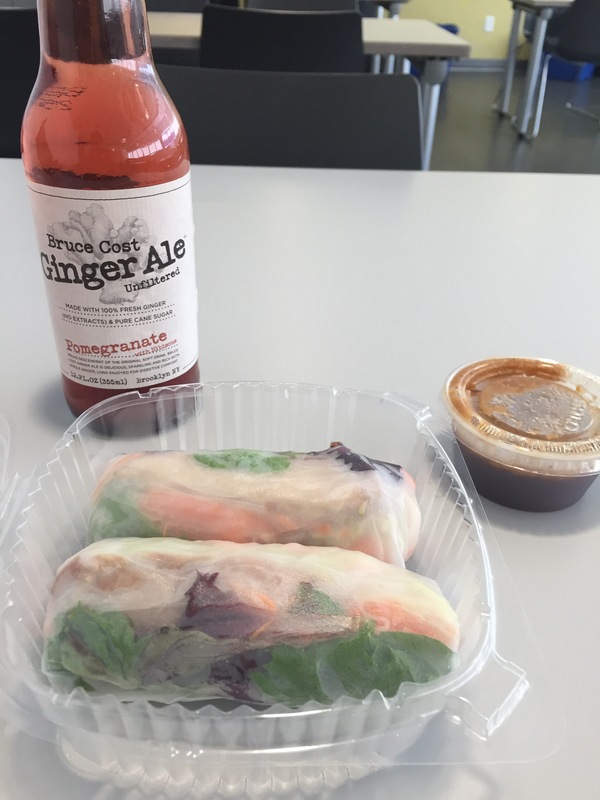 I ordered two chicken Spring rolls with a Bruce Cost Pomegranate ginger ale (Total cost: $7.50). Great value for a great lunch: so fresh and yummy, the flavors perked me right up. Amazing!